Live Action News – Yesterday, Planned Parenthood released its 2015-2016 annual report, five months later than usual. In it, it was found that – as in years past – health care services have decreased, while abortions have increased. The report also made sure to attack the Center for Medical Progress, claiming that its videos were “heavily edited” (a false claim). “In response to many BLACK WOMEN BEING DENIED ACCESS to health and social services, Sanger opens a new clinic in Harlem. It’s endorsed by the New York Urban League and supported by prominent Harlem churches,” the entry for 1930 reads. 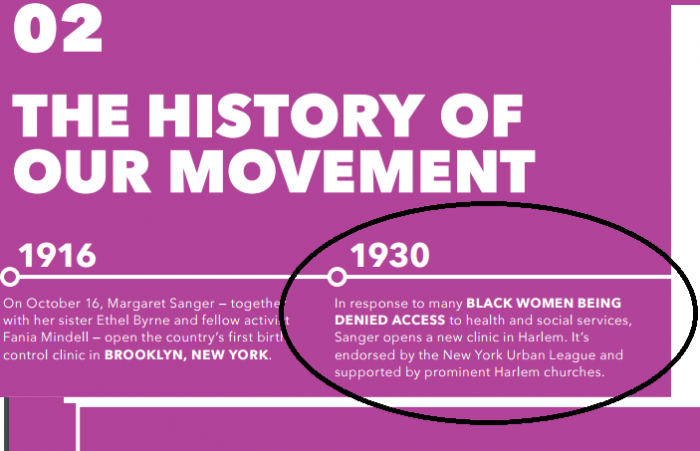 It’s clearly meant to show that Planned Parenthood has been there to help minority women…but it conveniently leaves out Planned Parenthood’s history of eugenics. As documented in the film Maafa 21, Sanger reportedly also wanted the government to put birth control in the drinking water of urban areas with heavy concentrations of minority populations. This article originally appeared on Live Action News and was written by Cassy Fiano.